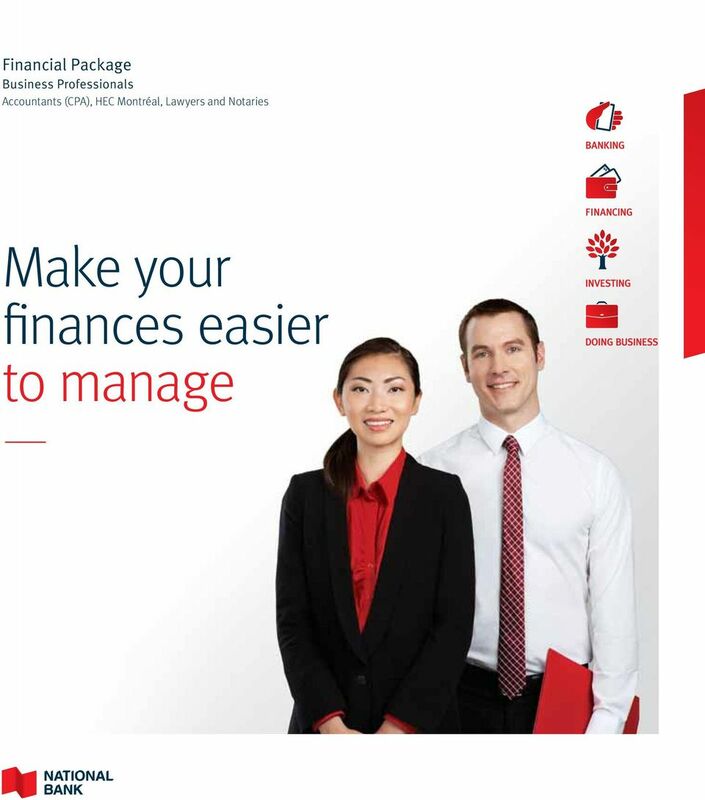 Download "Make your finances easier to manage"
2 02 FINANCIAL PACKAGE Business Professionals Understand, Plan, Act As a business professional of student, you lead a busy life and time is often in short supply. That s why we re offering you a complete financial package suited to your needs: let us give you access to personalized services and advice! First, we ll take the time to understand your situation and determine your financial profile. Then, we ll take action in order for you to achieve your goals. When you understand what s happening, you can plan accordingly and find the right solutions. This document is provided by National Bank and its affiliates for information purposes only, and creates no legal or contractual obligation for National Bank and its affiliates. The details of this service offering and the conditions described herein are subject to change. 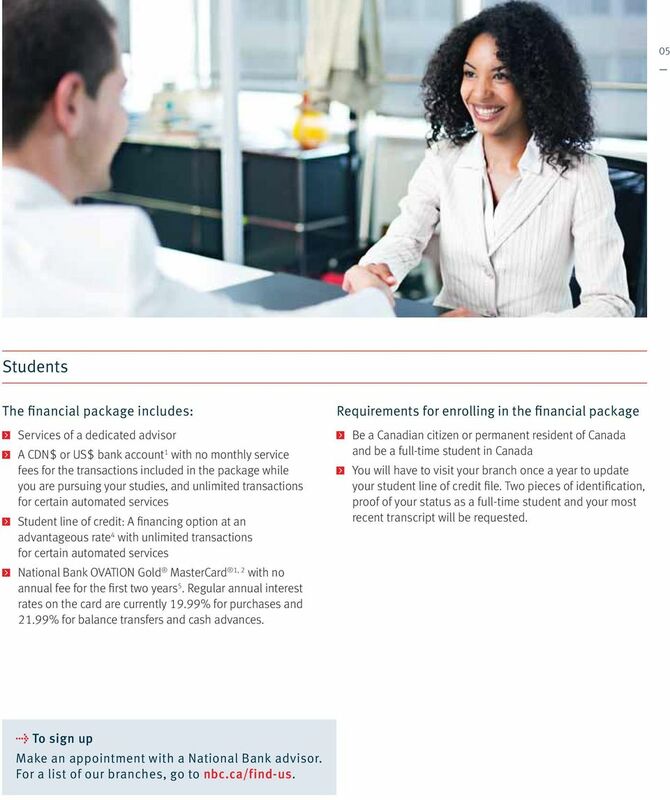 4 04 FINANCIAL PACKAGE Business Professionals Professionals and students: Quickly discover all the advantages of your financial package! Professionals The financial package includes: Services of a dedicated advisor A CDN$ or US$ bank account 1 for only $7.95 per month. If you maintain a minimum monthly balance of $2,500, you won t have to pay the monthly service fee covering the transactions included in the package Access to a National Bank OVATION Gold MasterCard 1, 2 at a reduced annual fee of $75 instead of $95. Regular annual interest rates on the card are currently 19.99% for purchases and 21.99% for balance transfers and cash advances. Plus, you can look forward to advantages on the following financing solutions: Personal Flex Line 2, 3 : A financing option at an advantageous rate with unlimited transactions for certain automated services National Bank All-In-One Banking 3, 3 An attractive mortgage loan 3 Take advantage of our business solutions: Up to two commercial accounts: A current account and a savings account with reduced fees on select transactions Financing solutions 3 Requirements for enrolling in the financial package Be a Canadian citizen or a permanent resident of Canada Provide proof of your professional status l Check out the many other advantages on personal and business solutions detailed in the following pages! 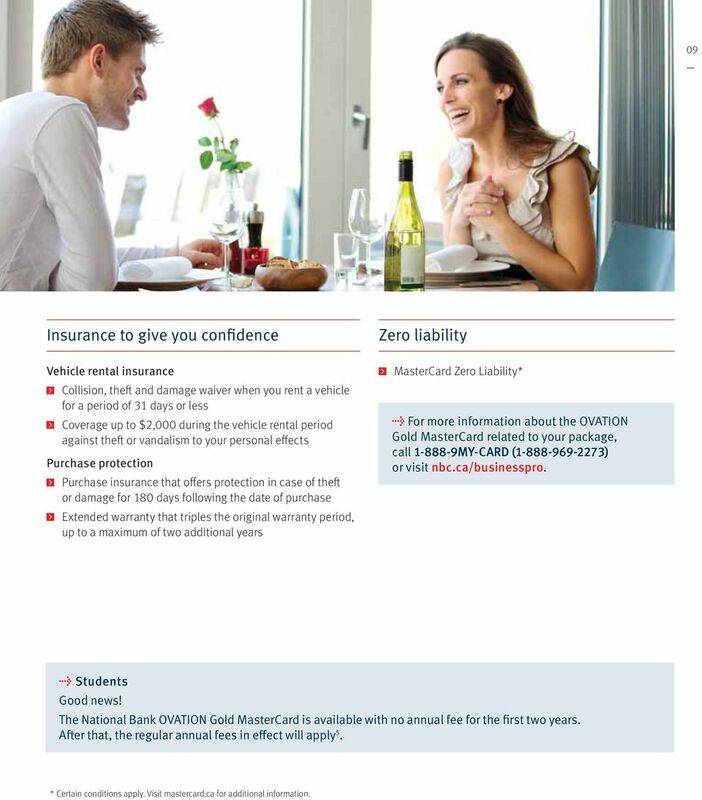 Your spouse can enjoy the personal banking advantages of the package as an authorized user*. * For financial packages, only the spouse of the primary cardholder is eligible for an additional card. 5 05 Students The financial package includes: Services of a dedicated advisor A CDN$ or US$ bank account 1 with no monthly service fees for the transactions included in the package while you are pursuing your studies, and unlimited transactions for certain automated services Student line of credit: A financing option at an advantageous rate 4 with unlimited transactions for certain automated services National Bank OVATION Gold MasterCard 1, 2 with no annual fee for the first two years 5. Regular annual interest rates on the card are currently 19.99% for purchases and 21.99% for balance transfers and cash advances. 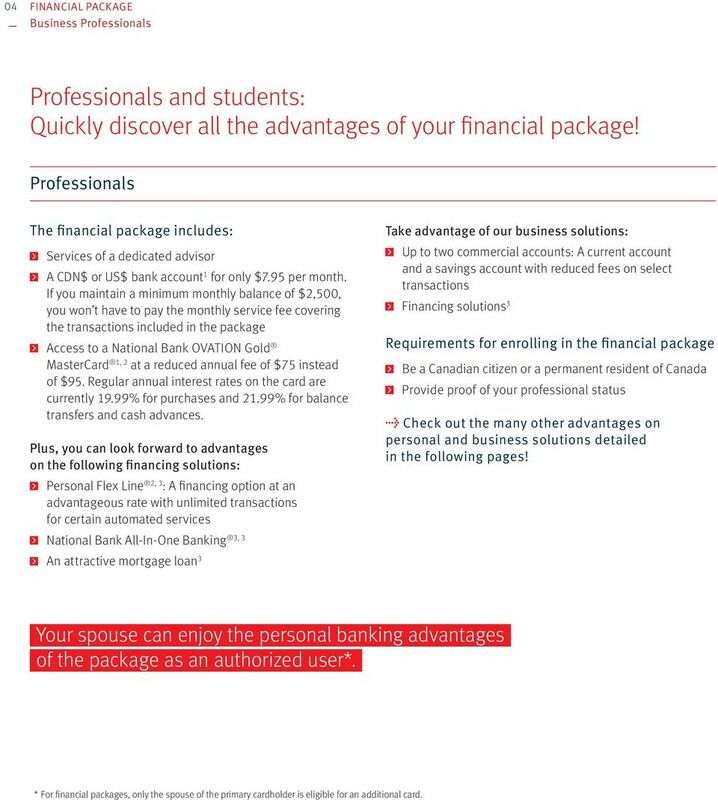 Requirements for enrolling in the financial package Be a Canadian citizen or permanent resident of Canada and be a full-time student in Canada You will have to visit your branch once a year to update your student line of credit file. Two pieces of identification, proof of your status as a full-time student and your most recent transcript will be requested. l To sign up Make an appointment with a National Bank advisor. For a list of our branches, go to nbc.ca/find-us. 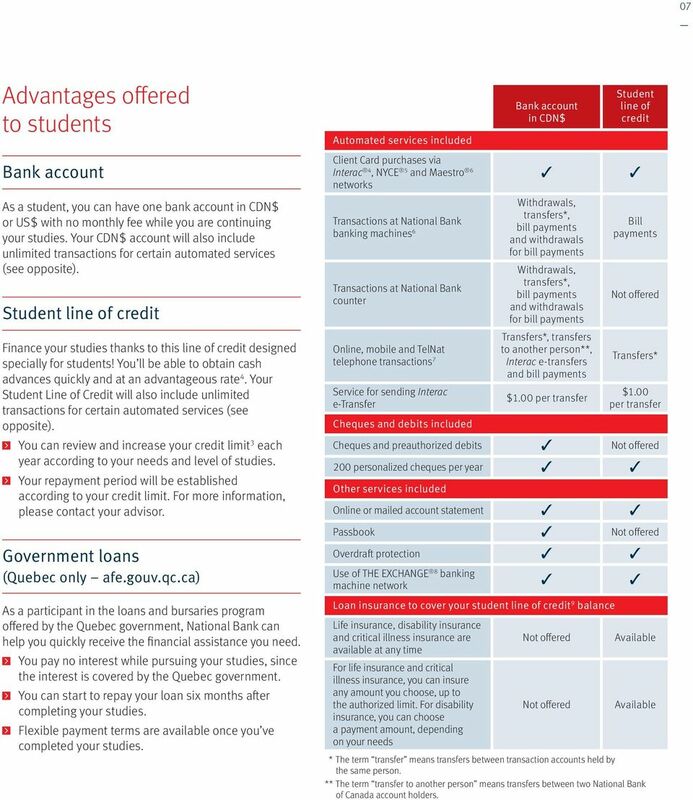 7 07 Advantages offered to students Bank account As a student, you can have one bank account in CDN$ or US$ with no monthly fee while you are continuing your studies. Your CDN$ account will also include unlimited transactions for certain automated services (see opposite). Student line of credit Finance your studies thanks to this line of credit designed specially for students! You ll be able to obtain cash advances quickly and at an advantageous rate 4. Your Student Line of Credit will also include unlimited transactions for certain automated services (see opposite). You can review and increase your credit limit 3 each year according to your needs and level of studies. Your repayment period will be established according to your credit limit. For more information, please contact your advisor. Government loans (Quebec only afe.gouv.qc.ca) As a participant in the loans and bursaries program offered by the Quebec government, National Bank can help you quickly receive the financial assistance you need. You pay no interest while pursuing your studies, since the interest is covered by the Quebec government. You can start to repay your loan six months after completing your studies. Flexible payment terms are available once you ve completed your studies. Automated services included Client Card purchases via Interac 4, NYCE 5 and Maestro 6 networks Transactions at National Bank banking machines 6 Transactions at National Bank counter Online, mobile and TelNat telephone transactions 7 Service for sending Interac e-transfer Cheques and debits included Cheques and preauthorized debits 200 personalized cheques per year Other services included Online or mailed account statement Passbook Overdraft protection Use of THE EXCHANGE 8 banking machine network Bank account in CDN$ Withdrawals, transfers*, bill payments and withdrawals for bill payments Withdrawals, transfers*, bill payments and withdrawals for bill payments Transfers*, transfers to another person**, Interac e-transfers and bill payments $1.00 per transfer Loan insurance to cover your student line of credit 9 balance Life insurance, disability insurance and critical illness insurance are available at any time For life insurance and critical illness insurance, you can insure any amount you choose, up to the authorized limit. For disability insurance, you can choose a payment amount, depending on your needs Not offered Not offered Student line of credit Bill payments Not offered Transfers* $1.00 per transfer Not offered Not offered Available Available * The term transfer means transfers between transaction accounts held by the same person. 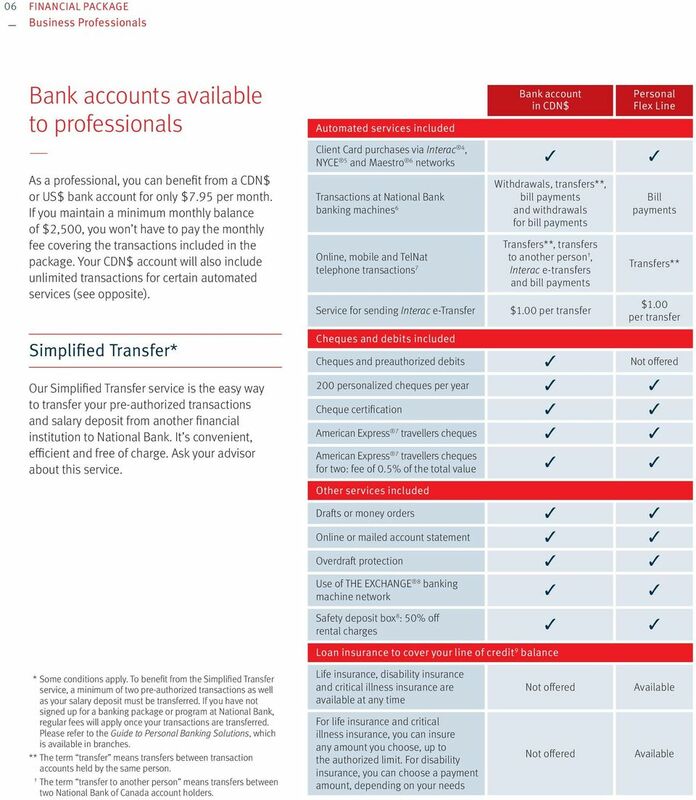 ** The term transfer to another person means transfers between two National Bank of Canada account holders. 8 08 FINANCIAL PACKAGE Business Professionals National Bank OVATION Gold MasterCard The OVATION Gold MasterCard 1, 2 gives you discounts on banking fees, a well-designed rewards plan and exclusive insurance coverage. The main card is offered at a reduced annual fee of $75 instead of $95. An additional card for your spouse is included. Regular annual interest rates on the card are currently 19.99% for purchases and 21.99% for balance transfers and cash advances. A generous and flexible À la carte Rewards Plan Treat yourself! 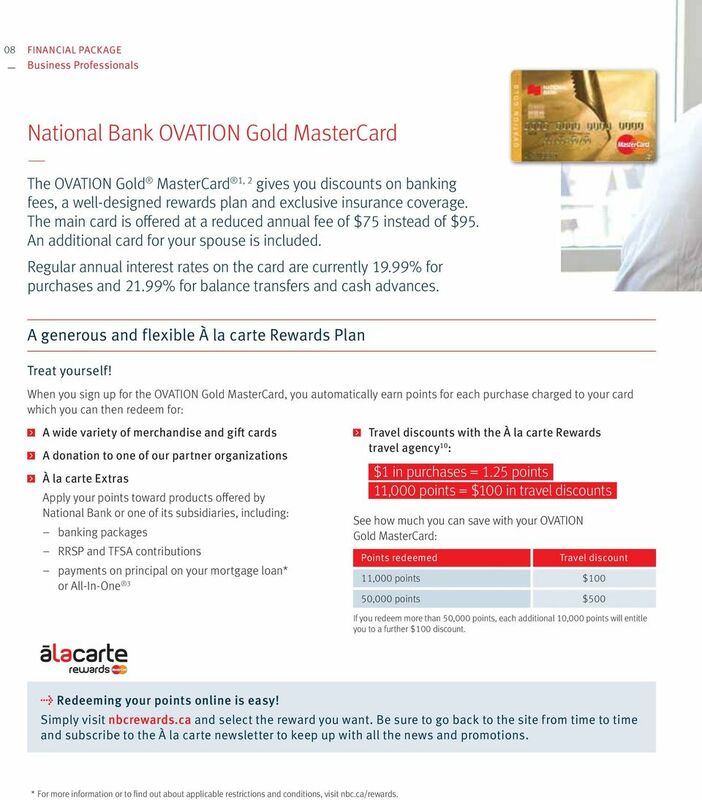 When you sign up for the OVATION Gold MasterCard, you automatically earn points for each purchase charged to your card which you can then redeem for: A wide variety of merchandise and gift cards A donation to one of our partner organizations À la carte Extras Apply your points toward products offered by National Bank or one of its subsidiaries, including: banking packages RRSP and TFSA contributions payments on principal on your mortgage loan* or All-In-One 3 Travel discounts with the À la carte Rewards travel agency 10 : $1 in purchases = 1.25 points 11,000 points = $100 in travel discounts See how much you can save with your OVATION Gold MasterCard: Points redeemed Travel discount 11,000 points $100 50,000 points $500 If you redeem more than 50,000 points, each additional 10,000 points will entitle you to a further $100 discount. l Redeeming your points online is easy! Simply visit nbcrewards.ca and select the reward you want. Be sure to go back to the site from time to time and subscribe to the À la carte newsletter to keep up with all the news and promotions. * For more information or to find out about applicable restrictions and conditions, visit nbc.ca/rewards. 9 09 Insurance to give you confidence Vehicle rental insurance Collision, theft and damage waiver when you rent a vehicle for a period of 31 days or less Coverage up to $2,000 during the vehicle rental period against theft or vandalism to your personal effects Purchase protection Purchase insurance that offers protection in case of theft or damage for 180 days following the date of purchase Extended warranty that triples the original warranty period, up to a maximum of two additional years Zero liability MasterCard Zero Liability* l For more information about the OVATION Gold MasterCard related to your package, call MY-CARD ( ) or visit nbc.ca/businesspro. l Students Good news! The National Bank OVATION Gold MasterCard is available with no annual fee for the first two years. After that, the regular annual fees in effect will apply 5. * Certain conditions apply. Visit mastercard.ca for additional information. 10 10 FINANCIAL PACKAGE Business Professionals Financing solutions at attractive rates for all your needs Professionals, find the approach that suits you and your projects. Personal Flex Line 2, 3 This line of credit is accessible at all times and gives you total freedom to decide how to use your funds. You can therefore take action quickly without having to reapply for credit when you want to get going on a new project. In addition to its advantageous rate, the Personal Flex Line includes unlimited transactions for certain automated services (see page 6). National Bank All-In-One Banking 3, 3 All-In-One Banking is an innovative home equity line of credit that offers you a convenient way to manage all of your finances, bank accounts and short-term liquidity needs. Offered at an attractive variable rate, this flexible solution with its multi-account concept lets you easily monitor each of your projects. Made-to-measure mortgage loan 3 You can divide your mortgage loan into any number of portions, each with its own rate, term, payment frequency and amortization period. Combine various types of mortgage financing to arrive at a solution that truly fits your needs! No matter what your needs, our financing solutions can help you meet them. Talk to your advisor to find out more. 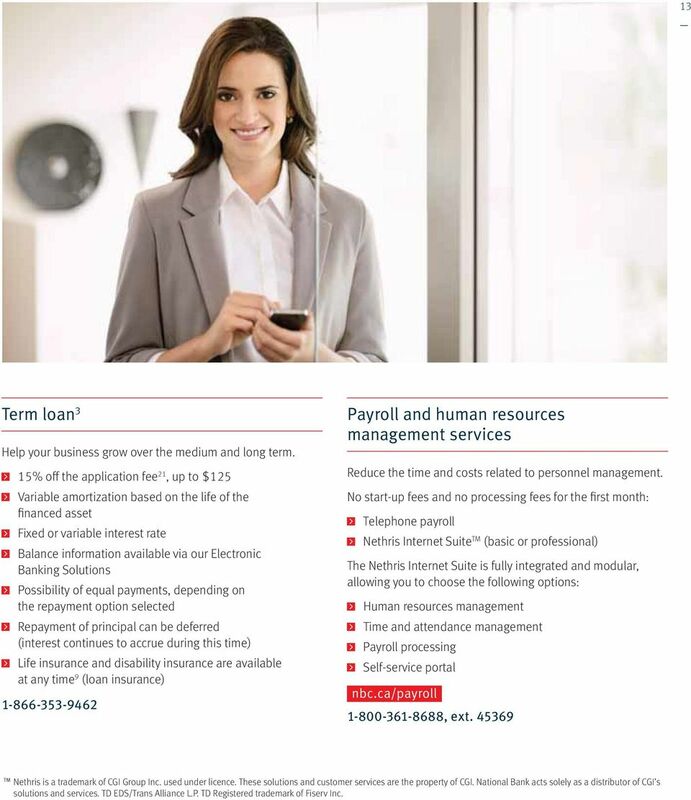 13 13 Term loan 3 Help your business grow over the medium and long term. 15% off the application fee 21, up to $125 Variable amortization based on the life of the financed asset Fixed or variable interest rate Balance information available via our Electronic Banking Solutions Possibility of equal payments, depending on the repayment option selected Repayment of principal can be deferred (interest continues to accrue during this time) Life insurance and disability insurance are available at any time 9 (loan insurance) Payroll and human resources management services Reduce the time and costs related to personnel management. No start-up fees and no processing fees for the first month: Telephone payroll Nethris Internet Suite TM (basic or professional) The Nethris Internet Suite is fully integrated and modular, allowing you to choose the following options: Human resources management Time and attendance management Payroll processing Self-service portal nbc.ca/payroll , ext TM Nethris is a trademark of CGI Group Inc. used under licence. 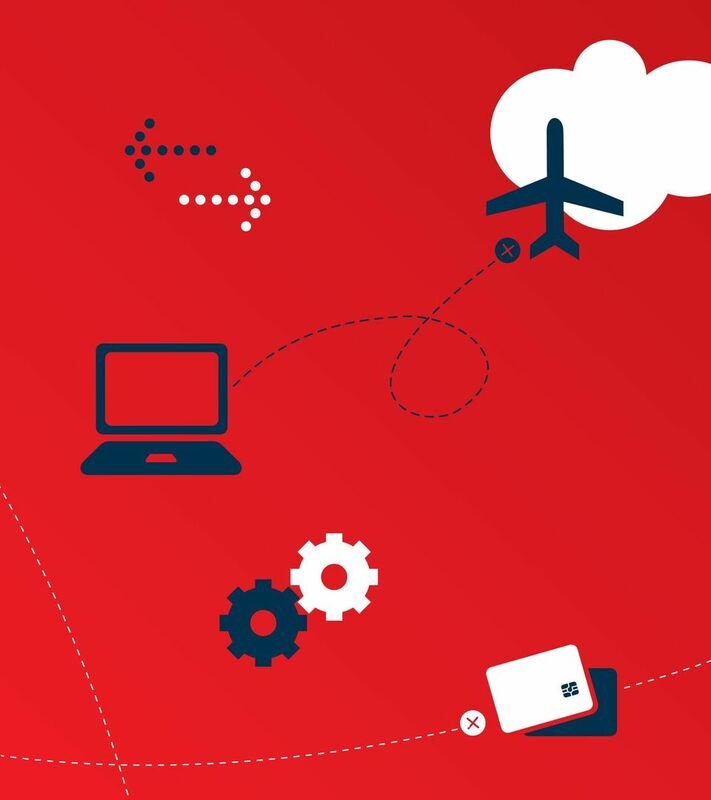 These solutions and customer services are the property of CGI. National Bank acts solely as a distributor of CGI s solutions and services. TD EDS/Trans Alliance L.P. TD Registered trademark of Fiserv Inc.
14 14 FINANCIAL PACKAGE Business Professionals 1 Bank account with chequing privileges. 2 Subject to credit approval by National Bank of Canada. Certain conditions apply. Grace period: No interest will be charged on purchases made during the month provided the client pays his balance in full within twenty-one (21) days of the date of the statement. This grace period does not apply to cash advances or balance transfers. The minimum payment to be made to the Bank every period will be equal to 3% of the account balance plus any overdue amount or $10, whichever is higher (or the account balance if it is lower than $10). If the credit limit is exceeded, the minimum payment required will be 3% of the account balance or the amount in excess of the credit limit, whichever is higher. Account statement: A statement is sent monthly. Examples of credit charges calculated for a period of thirty (30) days based on the rate in effect on October 1, 2014: AVERAGE BALANCE Annual interest rate $500 $3, % (regular rate for purchase) $8.22 $ % (regular rate for cash advances $9.04 $54.22 and balance transfers) 3 Financing subject to credit approval by National Bank. Certain conditions apply. 4 Subject to credit approval by National Bank. Certain conditions apply. A guarantor who meets the Bank s criteria may be required. The annual amount is based on your personal budgetary requirements. 5 Two years after the card is issued, the annual fee in effect at that time will be billed automatically and will appear on the account statement of the OVATION Gold MasterCard. On July 1, 2014, the annual reduced fee was $75 instead of $95. Offer not renewable. 6 User fees for the Interac 4 banking machine and point-of-sale network and the Cirrus 1 banking machine network are also payable. No additional fees apply for use of THE EXCHANGE 8 banking machine network. 7 Certain browser versions are required to access National Bank s Internet Banking Solutions and Mobile Banking Solutions. For information, go to nbc.ca/browsers. 8 Minimum 12-month rental in Canada. Some conditions apply, particularly concerning eligibility for safety deposit box rental. Details available in branches. Safety deposit box rental charges are indicated in the Guide to Personal Banking Solutions, which is available in branches. 9 Subject to the terms and conditions described on the insurance certificate. Certain exclusions and restrictions apply. Insurer: National Bank Life Insurance Company. 10 The dedicated travel agency is operated by Transat Distribution Canada Inc., holder of Quebec permit number and Ontario permit number National Bank Direct Brokerage Inc. is a wholly owned subsidiary of National Bank of Canada. National Bank Direct Brokerage Inc. offers no advice and gives no investment recommendations. The client alone is responsible for the financial consequences of his/her investment decisions. 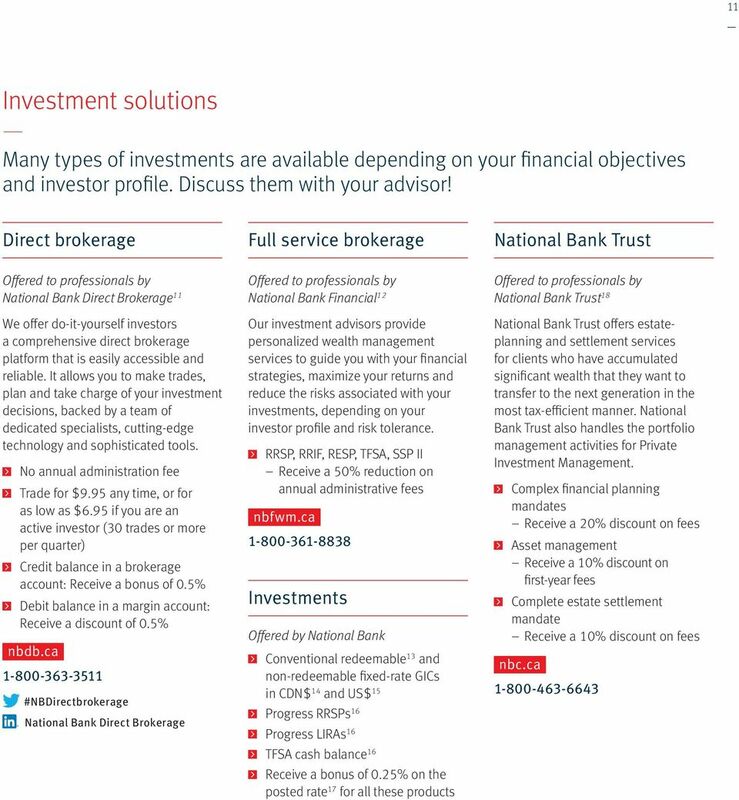 National Bank Direct Brokerage is a member of the Canadian Investor Protection Fund. 12 National Bank Financial is a wholly owned indirect subsidiary of National Bank of Canada. National Bank of Canada is a public company listed on the Toronto Stock Exchange (NA: TSX). 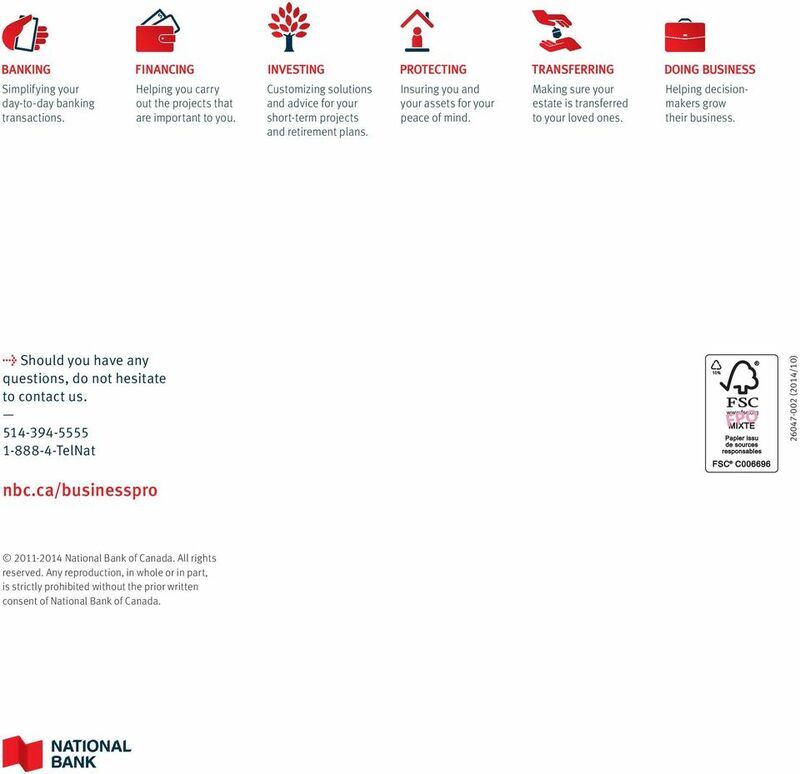 National Bank Financial is a member of the Canadian Investor Protection Fund. 13 Redeemable fixed-rate guaranteed investment certificates not available in LIRAs. 14 Offer only valid for redeemable and non-redeemable fixed-rate guaranteed investment certificates (GICs) in Canadian dollars. The minimum investment (Canadian dollars) required is $500 for registered GICs, $5,000 for nonregistered GICs (with a term of 30 to 364 days) and $1,000 for non-registered GICs (with a term of 1 to 5 years). The interest rate is based on the principal amount invested and the length of the term. For more information, visit nbc.ca under Rates. Simple interest or compound interest, at the client s option, paid annually. This offer may be withdrawn at any time without notice at National Bank s discretion. It is not transferable and may not be combined with any other offer or promotion, except as provided in this brochure. 15 Offer only valid for redeemable and non-redeemable fixed-rate Guaranteed Investment Certificates (GICs) in U.S. dollars. The minimum investment required is $5,000. The interest rate is based on the principal amount invested and the length of the term. GIC redeemable with penalty. Simple interest only payable at maturity for a term of 30 to 364 days and semi-annually for a term of 1 to 5 years. For more information, visit nbc.ca under Rates. This offer may be withdrawn at any time without notice at National Bank s discretion. It is not transferable and may not be combined with any other offer or promotion, except as provided in this brochure. 16 Minimum contribution of $ The interest rate is based on the amount of principal invested. For more information and the interest rates associated with each level of investment, visit nbc.ca under Rates. This offer may be withdrawn at any time without notice at National Bank s discretion. It is not transferable and may not be combined with any other offer or promotion. 18 Private Investment Management is offered by National Bank Trust Inc. and Natcan Trust Company, two subsidiaries of National Bank of Canada using the business name of National Bank Trust. Eligibility for this service depends on certain administrative conditions. 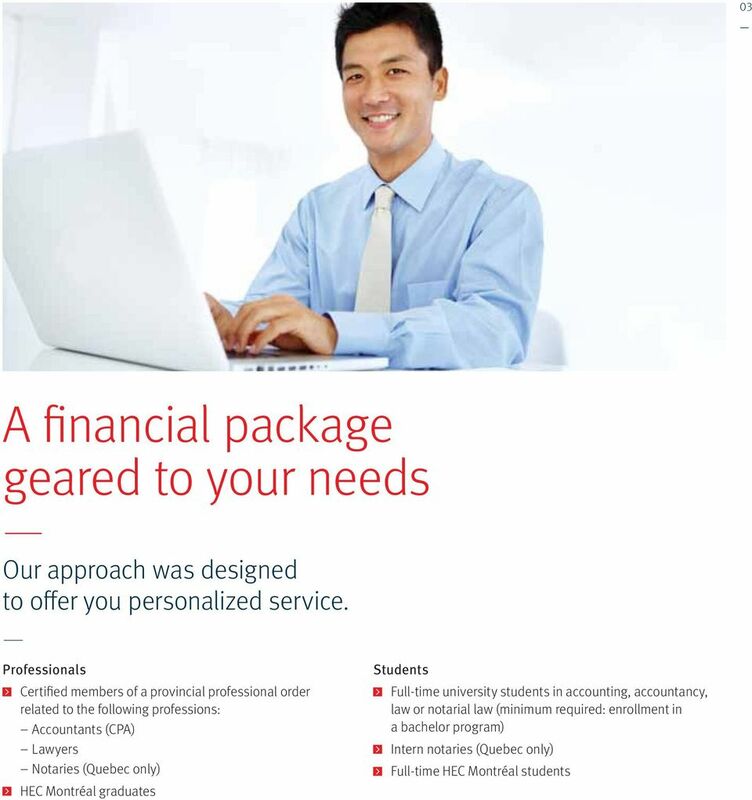 19 Please refer to our Fee Guide Banking Services for Businesses, which is available in branches. 20 The annual fee for the BusinessFlex Inc. line of credit is $250 if the limit is between $10,000 and $100, The term loan application fee represents 0.5% of the requested amount. OVATION Gold is a registered trademark of National Bank of Canada. 1 MasterCard and Cirrus are registered trademarks of MasterCard International Inc. Authorized user: National Bank of Canada. 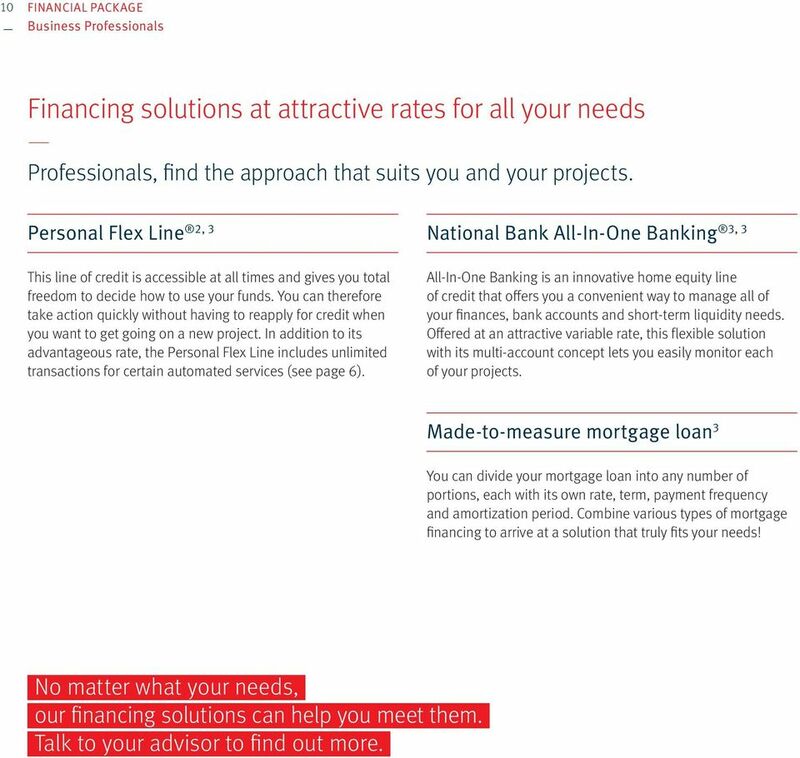 2 Personal Flex Line is a registered trademark of National Bank of Canada. 3 National Bank All-In-One Banking is a registered trademark of National Bank of Canada. 4 Registered trademark of Interac Inc. 5 Registered trademark of NYCE Corporation. 6 Maestro is a registered trademark of MasterCard International Inc. Currency exchange charges apply. For complete details about transactions in foreign currencies, please refer to the Agreement Governing the Use of Automated Services and Electronic Banking Solutions, available in branches or at nbc.ca. Transactions in foreign currencies other than U.S. dollars will first be converted into U.S. dollars and then converted into Canadian dollars. 7 Registered trademark of American Express Company US. AUT Copyright; American Express Canada, Inc SS-010-F. 8 Registered trademark of Fiserv Inc. For internal use: Please use F for applications. 16 Simplifying your day-to-day banking transactions. Helping you carry out the projects that are important to you. Customizing solutions and advice for your short-term projects and retirement plans. Insuring you and your assets for your peace of mind. Making sure your estate is transferred to your loved ones. Helping decisionmakers grow their business. l Should you have any questions, do not hesitate to contact us TelNat (2014/10) nbc.ca/businesspro National Bank of Canada. All rights reserved. 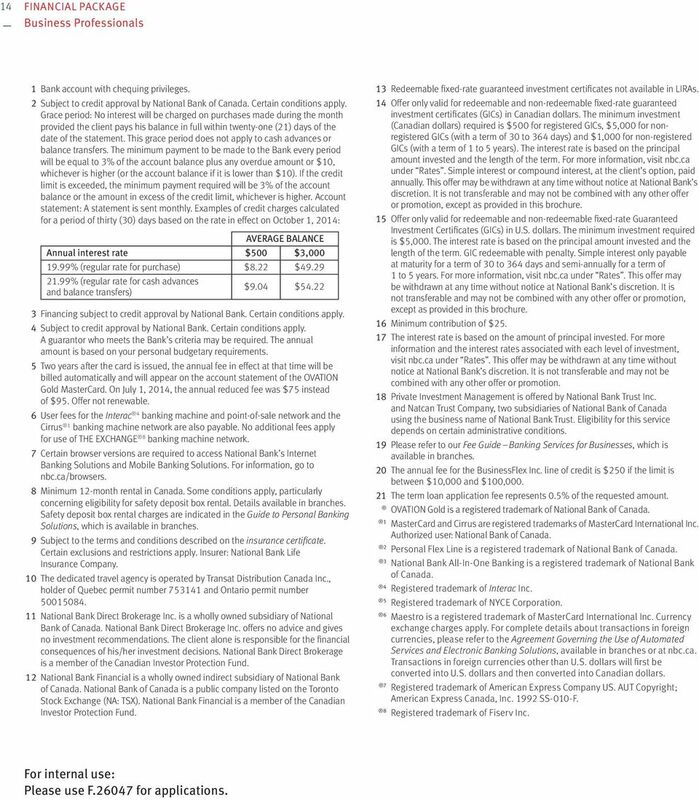 Any reproduction, in whole or in part, is strictly prohibited without the prior written consent of National Bank of Canada. 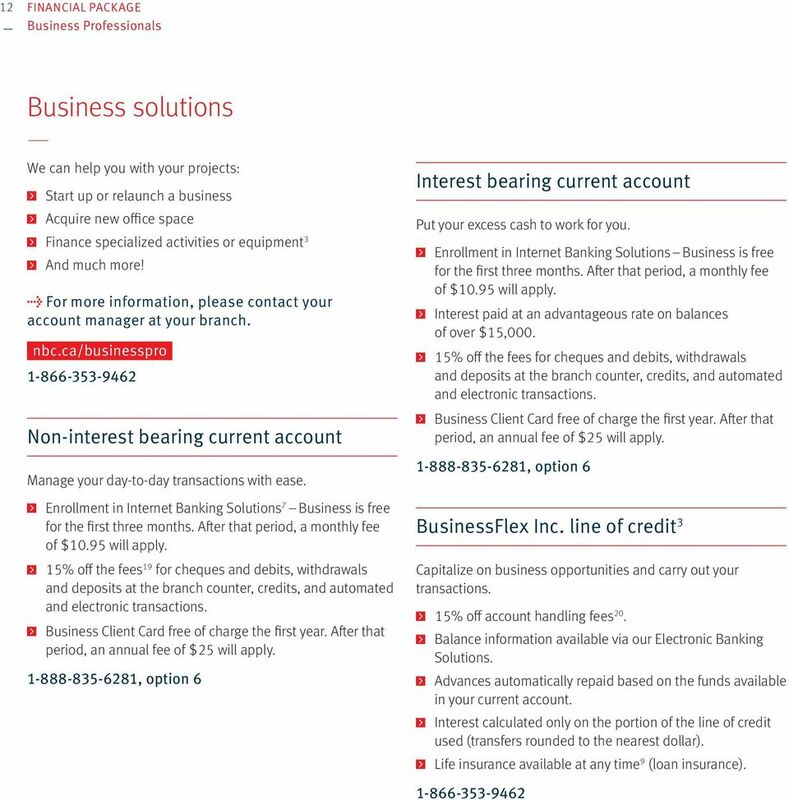 Commission and Fees Schedule Effective January 1, 2013 As a client of CIBC Investor s Edge, you have agreed to pay certain charges based on the types of investments you buy, sell and hold in your account. Banking system upgrade Your personal Guidebook Helping you through our banking system upgrade We re upgrading our banking system this fall to improve our ability to meet your needs, innovate and grow. The potential additional return is based on the performance of the S&P/TSX 60 Index (up to a specified maximum return). Get exposure to the stock market with principal protection and a guaranteed minimum return. Introducing the Market Powered GIC GICs will always be considered safe-haven investments for your portfolio. MEMBER SERVICES. 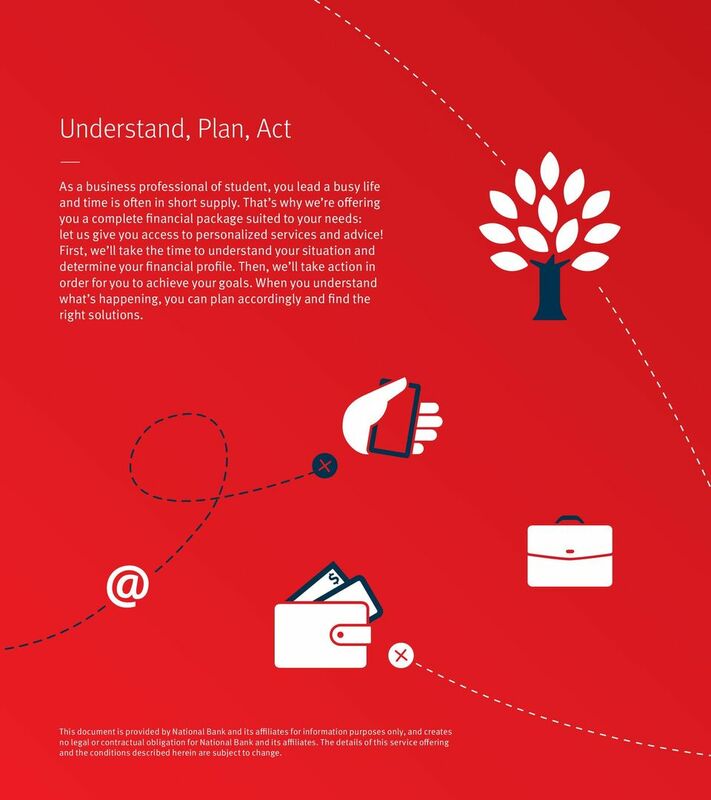 Your handbook to products and services.